We have a wide variety of brand name snack items for your vending machines including chips, cookies, breakfast items, soups and much much more. Our snack machine products will be based on the demographics of the account and will include items that your employees request in our pre installation survey. We will rotate in new products on a monthly basis and will eliminate slow moving items. The key to successful product selections is open communication between your employees and our route drivers. If you want items in the machine that are currently not in there please make a request through our website or by talking directly with our route drivers. They are trained to communicate with your employees to make sure the product selections in the machines are the items you want. 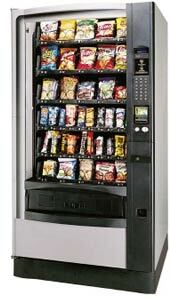 We will also stock your snack machines with a wide selection of healthy alternatives. For more information on our healthy selections please click here.